On Saturday December 5th the San Jose Scottish Rite hosted a Christmas party for the children of the clinic, their siblings and families. It was a great time for the families we serve to come together with Scottish Rite members, spouses and employees to celebrate the holidays. The banquet room and hallways were decorated with giant sized snowmen, trees and balloons. 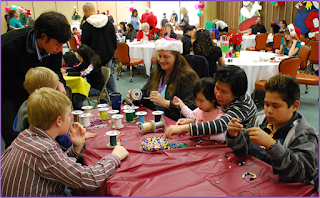 There were various activities for the children to enjoy such as coloring, bead crafting and cookie decorating. Snacks, drinks and cookies were enjoyed by all who attended. The big hit of the day was a visit from Santa. The children enjoyed sitting in his lap and telling their Christmas wishes. Santa had a gift for each child and sibling in attendance. After the party many of the parents expressed what a great time they had. Many of them also took the opportunity to express how grateful they are to be receiving services here at our clinic. A big thank you goes out to Susan Ramsey as well as the many other volunteers who contributed to the making of another successful Christmas party! A recent letter to the clinic….. Thank you so much for all of your help. We couldn’t have done it without you. We are so happy with our son’s progress. He is now ready to attend Challenger school in Sunnyvale. When we look back….we were frightened and worried to death about his speech, then we found you. We can truly say that you gave us comfort and gave our son the speech with which he is able to attend school. Thank you.